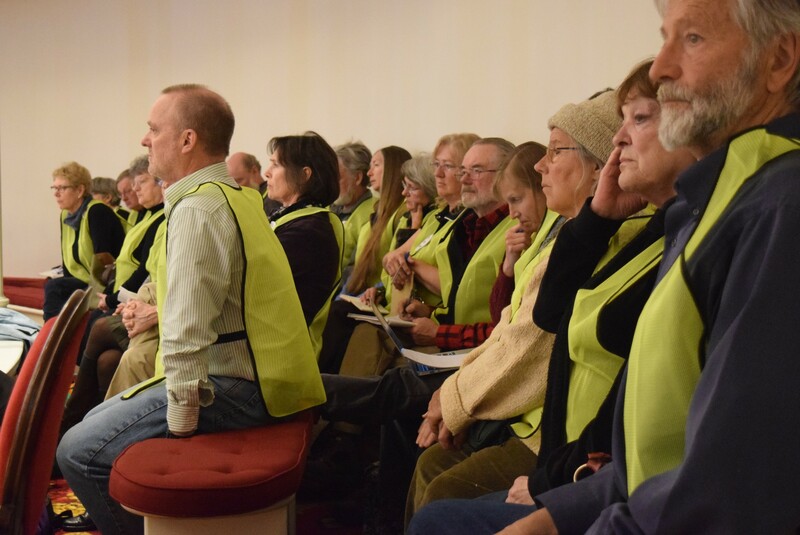 Opponents of wind projects line the House chamber Tuesday wearing neon green vests. When the Senate passed an energy siting bill earlier this year, a vocal group of wind-turbine opponents walked away disappointed. Their hopes that the bill would require continuous sound monitoring of wind projects were dashed. History suggested their chances of doing better in the more renewable-energy-friendly House were nil. “Over the past few years I’ve been here, nothing has ever gotten better in the House energy committee until now,” said Mark Whitworth, president of Energize Vermont, an organization that has been fighting large wind projects. So it was an odd sight this week as wind opponents cheered the unanimous passage of a revised energy bill in the House. The House bill, which passed 142-0 on Tuesday and was affirmed by a voice vote Wednesday, directs the Public Service Board to establish sound limits for wind projects through the state’s rule-making process. The sound limits would apply to any future wind projects. Wind opponents are optimistic the new sound limits will be lower than existing measures. The House bill would also give towns more say as the Public Service Board approves solar and wind projects, if they establish in town plans where renewable projects can go. Wind and solar critics found this, too, more to their liking than the Senate version, as it’s a less complicated process. After the vote, House Natural Resources and Energy Committee Chair Tony Klein (D-East Montpelier) was in an unusual position: He was winning praise from wind foes, who’ve long been his adversaries, and getting snarky texts from renewable energy developers, who’ve long been his fans. Klein, who is retiring from the legislature this year, said it was important for him to settle the issue before he left. A growing cadre of towns have complained they have no say as new solar and wind projects are proposed around the state. Rep. Marianna Gamache (R-Swanton), whose town is the site of a proposed seven-turbine wind project, credited the legion of local residents who returned to the Statehouse regularly this year with sending a strong message. Many of those visitors wore neon green vests to declare the pending danger they feel. Though they were visible, Gamache said, she wasn’t sure the House would give them relief. “I was very surprised, but delighted,” she said. Far less delighted was Anthony Iarrapino, a lawyer who represents the Swanton wind developers. It’s unfair for a developer to sink hundreds of thousands of dollars into planning a project, only to learn that sound standards may change later, he said. “The House is operating in ignorance of the real-world impacts on pending projects,” he said. Without those wind projects, he argued, the state can’t meet the renewable energy goals this same legislature passed last year. “We’re not going to get to the targets with solar in parking lots and a single wind turbine in backyards,” Iarrapino said. He said he hopes those provisions will still change as the bill goes to a House-Senate conference committee to work out differences in the two versions. Senate Natural Resources and Energy Committee Chair Chris Bray (D-Addison), said Wednesday he still has to study what the House did. “I’ll look at the pros and cons,” he said.